This 2018 lot of Mormora Estate was purchased by Collaborative Coffee Source at $3.55USD/LB FOB and our purchase price was $4.15USD/lb. Mormora Estate employs 16 permanent workers at 70-120 Bira/day. Pickers are paid 5 Bira/kg for the cherries they bring to the washing station. Mormora Estate is a community-based washing station in the village of Chekata in Guji, Oromia. All coffee processed at Mormora Estate is produced by “outgrowers” or local producers who bring their coffee in cherry to be processed at the station. Mormora Estate is part of the Guji Highlands Organization - in addition to cultivating coffee, they also purchase cherries from farmers, and run a variety of washing stations. Mormora Estate is an explicitly natural washing station, which means they’ve formed a strong experience in creating incredible clean cups with little to no taste of process. This coffee is certified organic, and grown in forest farms. Ethiopia has long been known as the “birthplace of coffee,” and as such boasts a immense genetic diversity of coffee varietals, many of which have still unfortunately not been scientifically identified, largely due to political constraints on the industry. As part of Ethiopia’s coffee history, the natural process forms a large part as this was in effect the original form of processing coffee. For those that don’t know, this process entails picking the ripest cherries and allowing them to dry in direct sunlight. In many countries, such as those Central and South America, the humidity after harvest and the lack of direct sunlight can make natural processing a risky move that can muddle the flavours of the coffee and take away from its complexity and cleanliness in the cup. Ethiopia, however, forms an exception to this rule. With abundant sunlight and heat during harvest, as well as centuries of tradition, the natural processed coffees produced in this country are typically very clean. Rather than detracting from the quality of the seed, once done properly the natural process can actually enhance or intensify certain flavour attributes. For example, the main ways that natural processing can effect the quality in the cup is in body, sweetness, and acidity. While many people are turned off by the soaring citric acidity of the washed Ethiopia coffee, naturals present a softer option. Add to that the fact that the sugars from the cherries are migrating towards the bean during the drying process, elevating the sweetness and the heavy bodied mouthfeel, and we end with a cup that is very comforting. As well, Ethiopian natural coffees are often the gateway for many people to specialty coffee because they boast incredibly pronounced flavours like strawberry and blueberry. We’ve worked with natural processed coffees from around Guji a lot in the last couple years — often they’re loved for their jammy fruitiness and interesting character. The Mormora is a much softer and refined version, but we love it just the same. At Mormora Estate, they produce 48,000kg of coffee a year. Harvest runs from November to December and the coffees are dried for 3 weeks on raised beds, and they aim for a final moisture goal of 11%. In any coffee producing country, it’s imperative that there exist organizations that support producers in achieving quality. Guji Highlands does just that. Not only do they cultivate and produce coffee at their Guji Highlands farm, they also run a series of other washing stations and processing sites where they purchase cherries from local growers and process these coffees for sale. In order to achieve higher quality standards, Guji Highlands provides financing to their members and assists with technical and agricultural advice. All of the farms and the farms they source from are forest farms — this means the land is owned by the Ethiopian government but leased to them on a 40 year term. During this time, growers are allowed to harvest cherries from the land but not induce cultivation on their own. 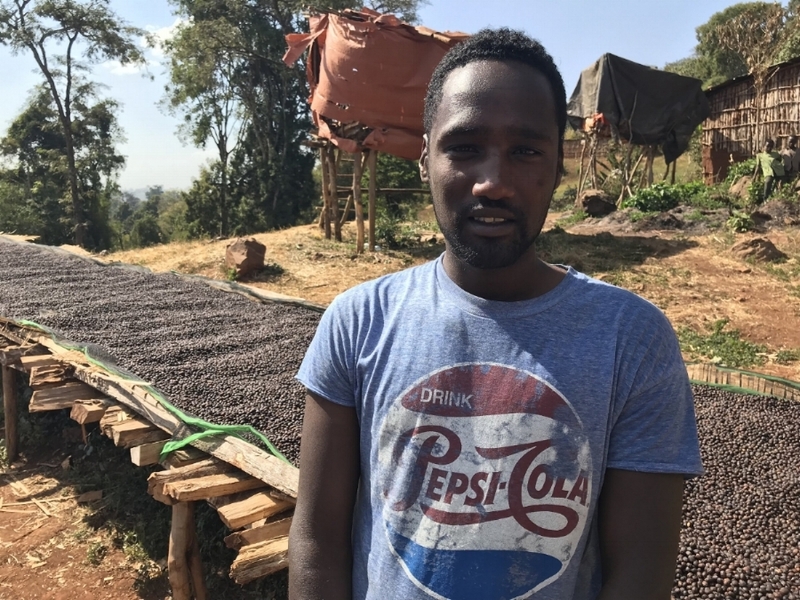 Though it is one of the most fascinating and compelling coffee producing countries in the world, the Ethiopian coffee market has long been beset by complicated legalities and ever-changing policies, not to mention political turmoil. In 2008, the Ethiopia Commodities Exchange was formed as a private body comprised of both private interests and the Ethiopian government. This was a sort of hub through which all commodities were to be traded and, in its most recent iteration, meant that buyers had to buy from centralized markets at “market price.” This meant that buyers were restricted to buying through an auction that offered no more information than a region — effectively eliminating transparency. Unlike in Central and South America, where we can relatively easily trace a coffee back to a single producer, such a task was this was very hard to do in Ethiopia. Luckily, the ECX was opened up and evolved in the recent years. There has been trepidation over whether the changes would roll out smoothly or achieve what they set out to, but early returns are promising. The auction system has now become entirely electronic, which allows for all the information to stay with the product through to final sale, and allows for an expansion of the data included such as traceability down to the Woreda or village where the washing station was located and the physical and sensorial data such as water activity, cup score, and moisture content. The ECX has also revised its grading system so as to improve the reliability, accuracy, and consistency of cup scores.